The Woo is gone out of Woo Pig Sooie. 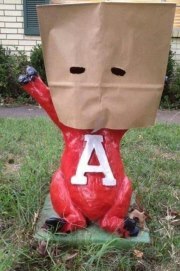 This says it all in Arkansas. If ever there was a case study in crisis management, University of Arkansas Razorbacks Athletic Director Jeff Long now has one on his hands. From the Spring Sunday when Bobby Petrino took an infamous motorcycle ride with a young athletic staff employee, to the Razorback‘s temporary Band Aid with John L. Smith, to losing to a “cupcake” in the Sun Belt Conference, to an embarrassing home wipeout at the hands of the Univerity of Alabama, then Rutgers … and in the midst of it all a series of incomprehensible statements made by Smith (including the latest today) and the apparent oversight of Smith’s $25 million in debt, Long is now far past the job of trying to prevent apathy among fans who were once hopeful for the Razorback’s first national championship in three decades. He’s now faced with how to stop people from making a mockery of his school. That’s never happened before. The word cited most often of Smith’s performance is “moronic.” He doesn’t even know where he is, folks. A “Fire John L. Smith” Facebook Fan Page is gaining momentum. Once loyal fans, even in the face of the most imaginable of circumstances, are now repugnant toward the program. Truth is, Smith should have been dismissed in the post game following a historic shutout at the hands of the Crimson Tide when his team shut down. It certainly should have happened Saturday night after the Rutgers fiasco. It’s no longer a matter of salvaging a football season. Now it’s a lot more. Some things are simply unpermissable. Long is faced with the decision and showing his fan base the “unacceptability” of the circumstances. I think you’ll see it in the next 24 hours. Having lived in Razorback country for six years, I know theRazorback faithful are probably nearing a revolt especially after the beating to the hands of Texas A&M. Killed by an SEC rookie team, quit in the second half against Bama, fiascos with ULM and Rutgers. You couldn’t make up a more disasterous scenario.